Cookies and chocolate. 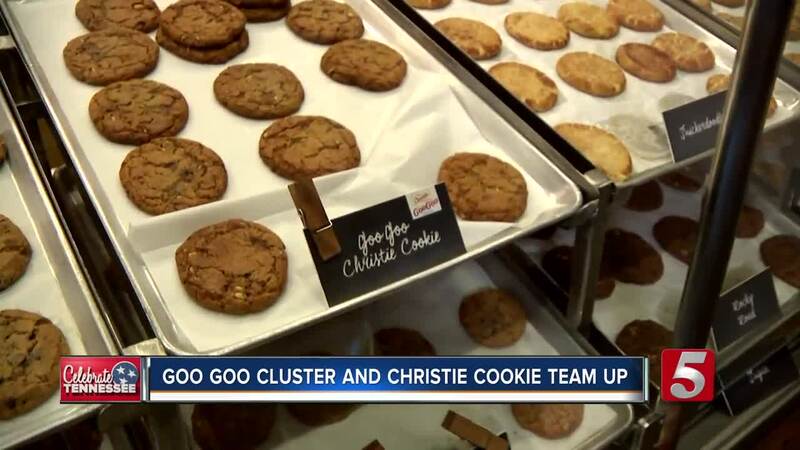 They're two of the most popular sweets in the world, and for the rest of October, Christie Cookie and Goo Goo Cluster are joining together to bring cookies and chocolate into one. “We’ve talked with Christie Cookie throughout the years. We’ve always wanted to work together, but the fact that we used to be only in large production facilities, we never really had the flexibility to test things and have a little more fun," Laurie Spradley, Goo Goo Cluster director of brand development, said. The result: a Goo Goo Cluster filled with a Christie Cookie and other goodness, and a Christie Cookie that's filled with a Goo Goo Cluster. “They’re so good, they are flying off the shelves. We’re having people call like for dozens of them before they’ve even tasted them, and then once they taste them, they want a dozen more," Chrissy Cano, store manager of the 12 South Christie Cookie said. While both companies distribute plenty of product, most of their products are mass produced in their large facilities. With Goo Goo Cluster opening their downtown shop, they also opened up a smaller kitchen that allows them to do smaller, more unique projects and collaborations. With the opening of Christie Cookie's 12 South shop that also includes a kitchen that will allow for smaller, more unique projects, the two Nashville companies joined together to create a dessert dream team that has people drooling over their new products. Both Nashville sweet companies said they hope to continue working with each other in the future with more special treats, and they also plan to work with other Nashville companies to continue to bring unique products to customers. As for the Christie Cookie Goo Goos, they're only available at the Goo Goo Cluster shop on 3rd until the end of the month. The Goo Goo Christie Cookies are only available at the Christie Cookie shop in 12 South until the end of the month.